Located in the beautiful village of Grasmere, Greens is surrounded by some beautiful views and landmarks for you to explore. Grasmere is located in the centre of the English Lake District and sits on the River Rothay that flows into the village. Known for its beautiful lakes and home to lake poets the village is known as the home to William Wordsworth. Living in Grasmere for 14 years Wordsworth described the village as the “loveliest spot that man hath found”. Living in Dove Cottage for nine years Wordsworth wrote much of his poetry in the cottage which is known today. 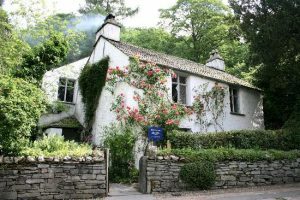 The cottage today has been turned into a museum which is open to visitors who can get an vivid impression of what day to day life was like for Wordsworth. 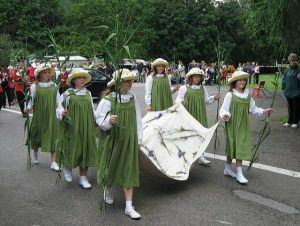 Keeping with tradition Grasmere celebrates a number of events throughout the year such as the Rushbearing Festival and Grasmere Sports. Both take place every year and are celebrated by people in the village who are keen to keep the traditions alive. Grasmere sports takes place in August and was first held in 1952. 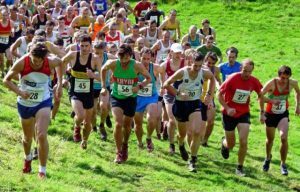 It is one of the most popular events in the lakes and consists of Cumberland wrestling, fell running and hound trials. 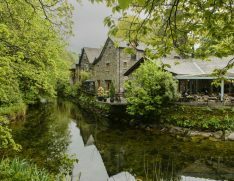 Grasmere Is also home to the famous ‘Grasmere gingerbread’ which is made using a “secret recipe” created by Sarah Nelson. By the early nineteenth century the gingerbread was being sold as ‘fairings’ which were very popular with those living in the village. 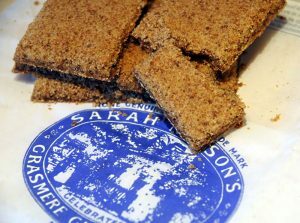 Sarah Nelson’s famous Grasmere gingerbread can be found at The Grasmere Gingerbread Shop in the village. The staff are all dressed in victorian clothes where you can buy Grasmere gingerbread and other ginger themed gifts. In and surrounding the village are a number of walks and landmarks for you to explore. Grasmere Lake is one of the smaller lakes in the Lake District and gives its name to the village of Grasmere. 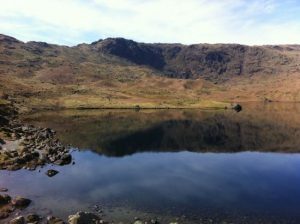 Within walking distance from the café is a walk to Easedale Tarn. 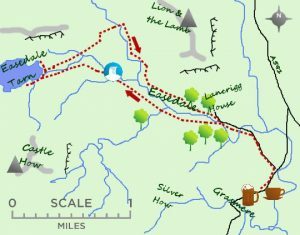 A 5.5 mile walk which is situated high in the upper valley of Easedale. To the south of the tarn is the long ridge of Blea Rigg. During Victorian times it was even more popular than it was today. A refreshment hut used to ply a good old trade but little remains now just a few scattered stones. The tarn is about 21m deep, with it's outfall tumbling down some lovely waterfalls which are situated right beside the path. 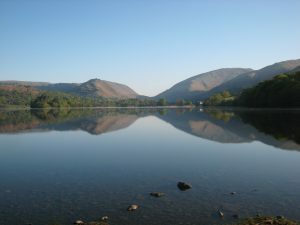 If you would like to find out more about Grasmere visit: https://www.visitcumbria.com/amb/grasmere/. We hope you enjoy your visit to Grasmere just as we do. 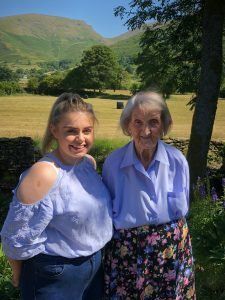 Our social media guru, Holly Goddard met up with local resident Mary Bower to find out more about the annual Grasmere Rushbearing Festival. 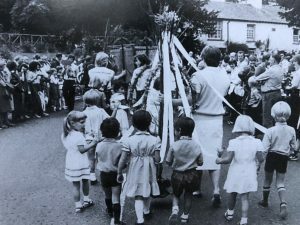 Rushbearing has been celebrated in the village since 1860. It is a tradition that is celebrated every year by those living in the village who are keen to keep the tradition going. 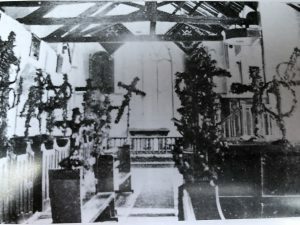 The Rushbearing Festival originated when rushes were laid on the church floors during the day and evening as the ground was too earthy in the winter. 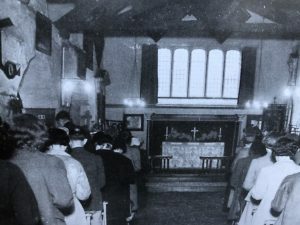 Celebrating Rushbearing is an ancient custom of strewing the seats with rushes, which was annually done the day after the rector had gathered his tithe wool. 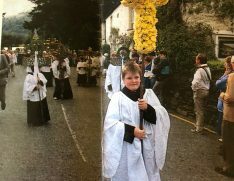 During the procession, children carry traditional bearings made by themselves, every year the bearings are different, depending on the flowers available. Just before the procession moves off, the children who have a bearing are given a five pence coin to exchange for a piece of Grasmere gingerbread. With the procession moving nearer the rush maidens appear in their green and white dresses. The rush maidens are chosen up to the age of eleven and can only be a rush maiden for two years. The rush maidens carry the rush sheet and are positioned with one in each corner and one each side in the center. Joining the rush bearers are a band , the procession cross, woven with gold helenium flowers. Next comes seven of the traditional bearings from the rectory grounds, the choir, clergy, Churchwardens, and bishop. Then comes St. Oswald’s banner and the children circling the maypole held by an older girl. Followed by a band playing Jimmy Dawson’s March and Owen Lloyd’s hymn. Although there is a set order for the procession everyone can join in providing they have a bearing they have made themselves. Over the years many people in the village have contributed to the festival by making small bearings, including Mary herself. 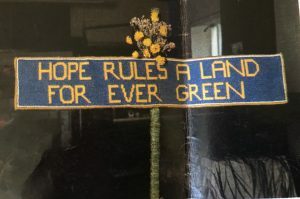 Below is a simple flower design with the words ‘HOPE RULES A LAND FOR EVER GREEN’ in cross stitch made by Mary using flowers and thread. Our kitchen assistant Rebeca has been a rush maiden for the Rushbearing festival, we felt this would be a good opportunity to get a picture of both Mary and Rebecca who have both been involved in the festival. 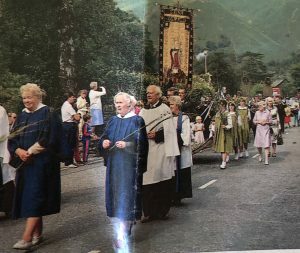 After the observance of St. Oswald the children collect their bearings and proceed to the school field for a version of the world famous Grasmere Sports. This consists of flat races, Cumbrian wrestling and even a mini fell race. Certificates and trophies are presented to all the children who have a tea ticket which are provided with an enormous feast and a piece of Grasmere gingerbread. Mary has lived in Grasmere since 1966 so we felt this would be a good opportunity to ask her what she enjoyed about living in the village. 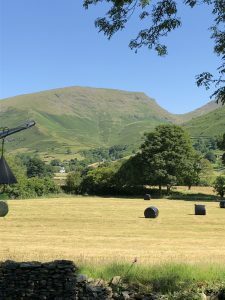 “The village is lovely and I am very lucky to be close to such beautiful views of the fells”.